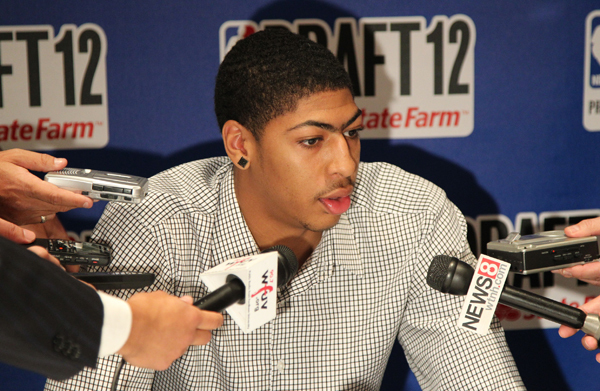 When 19-year-old Anthony Davis is called to the stage by David Stern tonight as the first overall pick in the 2012 NBA Draft, the combined expectations of a team, a league and the global hoops universe will suddenly be heaped upon him. You’d have to go back to the top selection of LeBron James in 2003 to find as much excitement and hype surrounding the #1 pick. No one doubts that Davis’ upside is unlimited, that he is the type of player a franchise can build around or that his skill set and total package are so rare as to be seen once a decade. After all, this one-year Wildcat won National Player of The Year, Defensive Player of The Year and Freshman of The Year – a trifecta never before achieved. Davis, who led Kentucky to the 2012 National Championship, has no peers in this year’s draft. The first overall selection in the draft is always remembered, whether as a Hall of Famer, NBA Champion, trivia answer, icon or bust. To be chosen #1 means that you are expected at a minimum to be a multi-year All-Star and to contribute right away to the down-on-its-luck team that was fortunate enough to win the draft lottery. Some #1 picks did just that: Patrick Ewing, David Robinson, Shaquille O’Neal, Tim Duncan, LeBron and Blake Griffin. Other #1 picks had the misfortune of A) being widely overrated by professional GM’s or B) being the best amateur player in a horrible top-to-bottom draft class or C) suffering early career-changing injuries as did Pervis Ellison, Joe Smith, Michael Olowokandi, Kwame Brown and Greg Oden. Tonight’s draft has been described as average to slightly above-average by experts and executives. Davis is considered the only sure thing in this class. He has been compared to Kevin Garnett, Tim Duncan and a longer, more polished Scottie Pippen. Davis’ wicked defense is already an A+. His size and athleticism will allow him to play virtually anywhere on the court. Davis has great hands, instincts and a 7’5” wingspan. He gobbles up boards. He possesses a relentless motor matched with a genius basketball IQ. And Davis is a proven winner with an unselfish, team-oriented outlook. Will the pride of the South Side of Chicago average 20 and 10 with 3+ blocks next season for the New Orleans Hornets and get them back into the playoffs? The folks down in the battered Big Easy hope so. Nothing is certain in sports and in one minute everyone’s darling can turn into the prognosticators’ verbal punching bag. That’s what makes the analysis on draft night so varied and exciting. I expect Anthony Davis to be a top-10 NBA talent for years to come. On March 22nd, University of Memphis sophomore Will Barton declared himself eligible for the 2012 NBA Draft. The wiry Baltimore product improved his numbers drastically across the board in his second collegiate season, averaging 18.1 ppg, 8.1 rpg and 3.0 apg. The 6’6” SG/SF can score from anywhere on the court and knows when to shoot and when to dish. This offensive balance makes it tough to stop Barton, who shot more than 50% from the field and posted season highs of 30 points, 16 boards, 7 dimes, 4 blocks and 4 steals (3X) in 2011-12. Barton’s soft touch matched with a quick catch-and-shoot make for a lethal combo. He also excels at slashing and cutting to the basket and finishes with an array of floaters, often finding kind rolls and bounces due to his feathery release. The most potent weapon in his scoring arsenal is his mid-range shot off the dribble, a skill that should translate well at the NBA level. On the defensive end, the versatile 21-year-old can guard the opposing PG, SG and SF. Barton moves well laterally and disrupts the passing lanes with his length and anticipation. He averaged almost one block per game and 1.4 steals per game. Barton’s rebounding prowess allows him to start fast breaks, and with his open floor dribbling ability he often goes coast to coast. Barton’s main weakness is his thin, 175-pound frame. At the pro level, core strength is important in all aspects of the game, which may scare some GM’s from taking a chance on Barton. He is projected to be selected late in the first round on June 28th in Newark.